While developing an Azure Function application, using this tutorial, I encountered a problem. 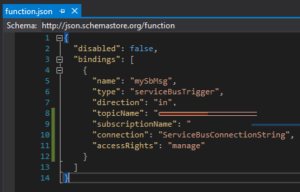 Side note: the mySbMsg is important – it’s defined in the function.json bindings, and must match. When sending messages to my topic, they weren’t being picked up by my function. // is not supported for an entity with partitioning and duplicate detection enabled. The messages were definitely being delivered to the topic – I could see that in the Azure portal. However, the function wasn’t picking them up. The issue was around the string mySbMsg parameter. Changing this parameter to be a byte – and my messages are now received by my locally running function.